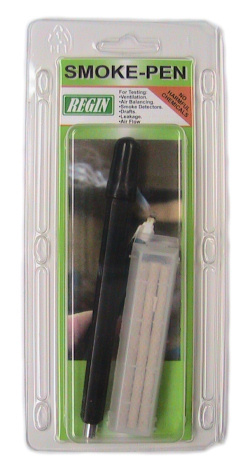 The Regin Smoke Pen is an important tool enabling you to detect air movement and locate air leakage. This home air leak detector pen emits a continuous stream of light weight white smoke allowing the user to see air movement. Air leakage can account for 40% of the heat loss or gain in your home. Finding and sealing these costly sources of heat loss with an smoke leak detector is essential to creating a comfortable and energy efficient building.